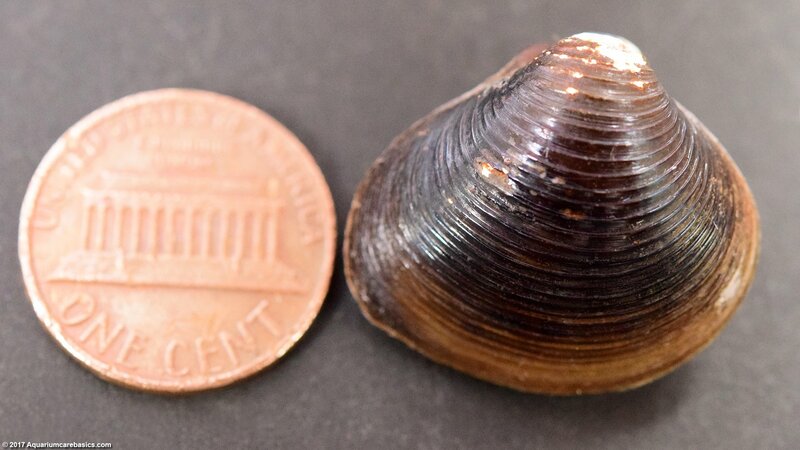 Hobbyists may see Freshwater Clams, like Asian Gold Clams, available as pets in stores. 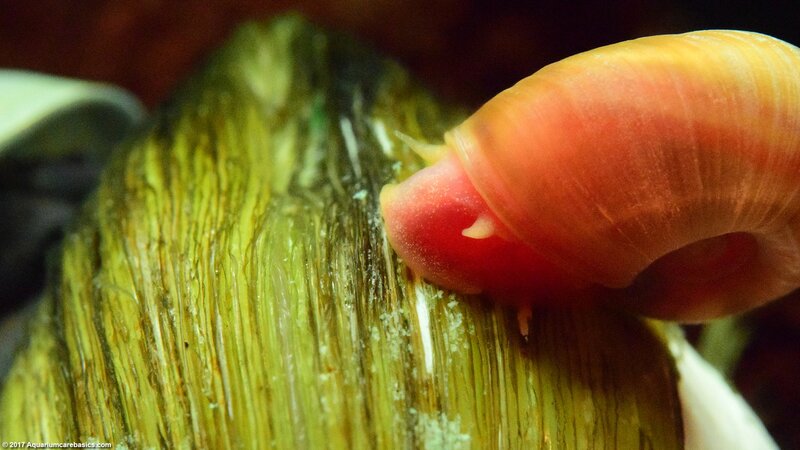 Some hobbyists think Freshwater Clams are easy to care for and are interesting pets to keep. 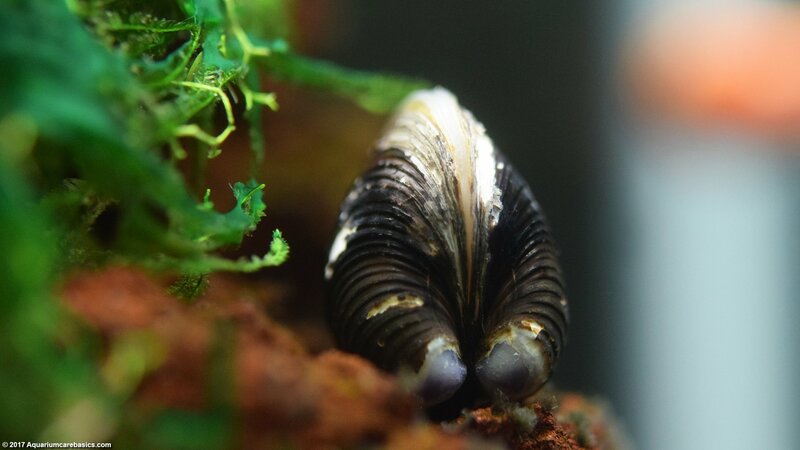 Other hobbyists think keeping Freshwater Clams is a big mistake, as they can be challenging to keep alive and can quickly cause problems in a tank. Pros: Freshwater Clams are peaceful, friendly and non-aggressive filter feeders. Their filter feeding helps remove debris from tank water, and they are great conversation starters. Freshwater Clams make good tank mates with other calm choices like Amano Shrimp, Red Cherry Shrimp, Ghost Shrimp, Bamboo Shrimp and Vampire Shrimp. 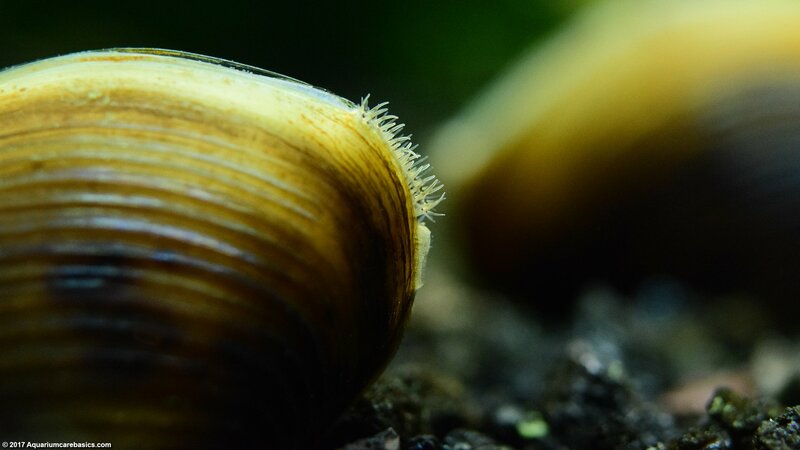 Freshwater Clams can also do well with snails such as Nerite Snails, Mystery Snails, Gold Inca Snails, Ivory Snails, Trumpet Snails, Japanese Trapdoor Snails, Rabbit Snails and Red Ramshorn Snails. Keeping Freshwater Clams with most community tank fish like Corys and Otocinclus Catfish can also work well. Cons: Freshwater Clams can die soon after being placed in a tank. If not removed quickly, their decomposing bodies can cause serious water quality issues including foul smells, milky-white cloudy water, ammonia spikes and death to tank mates. 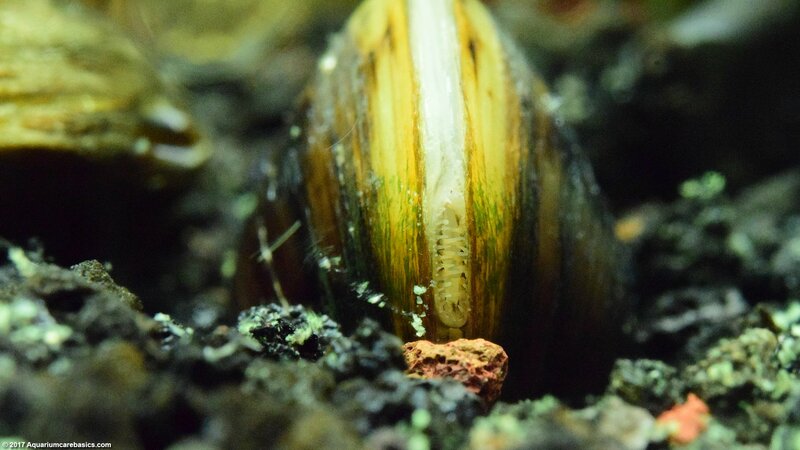 Freshwater Clams can die while buried and hobbyists may not notice until the tank water becomes extremely troubled and ammonia levels spike through the roof. 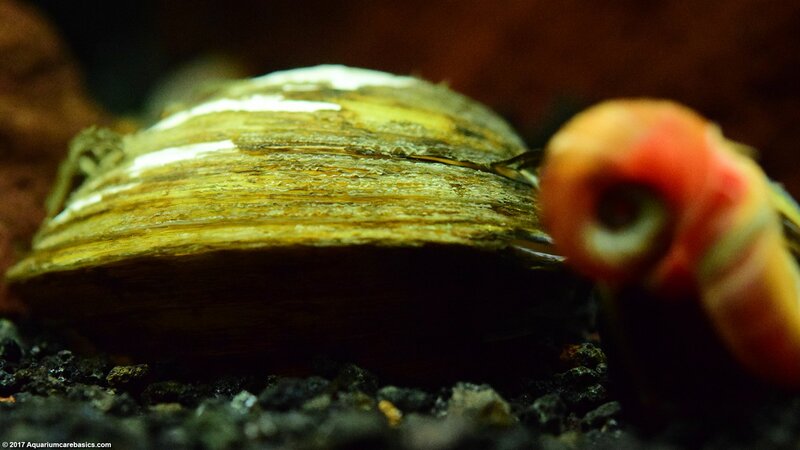 When selecting Freshwater Clams look for specimens resting on the tank bottom. Freshwater Clams should have their shells closed or slightly open. 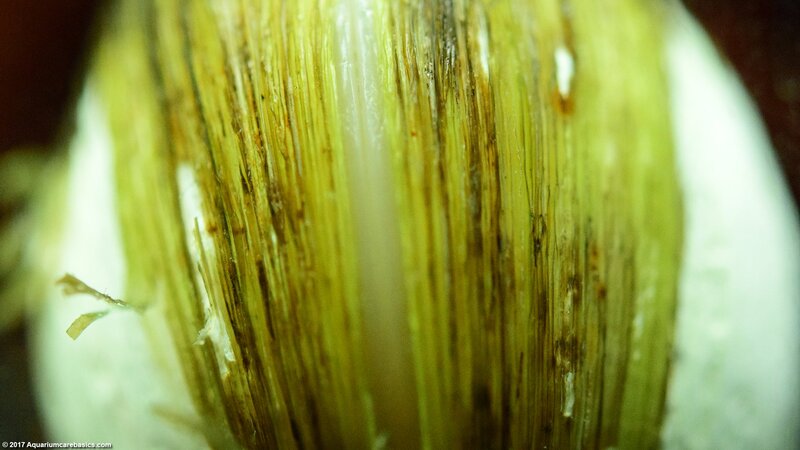 If slightly open, the clam’s inner tissues should be visible to the eye. A Freshwater Clam’s inner tissues should be white or off-white with hints of light beige and pink. 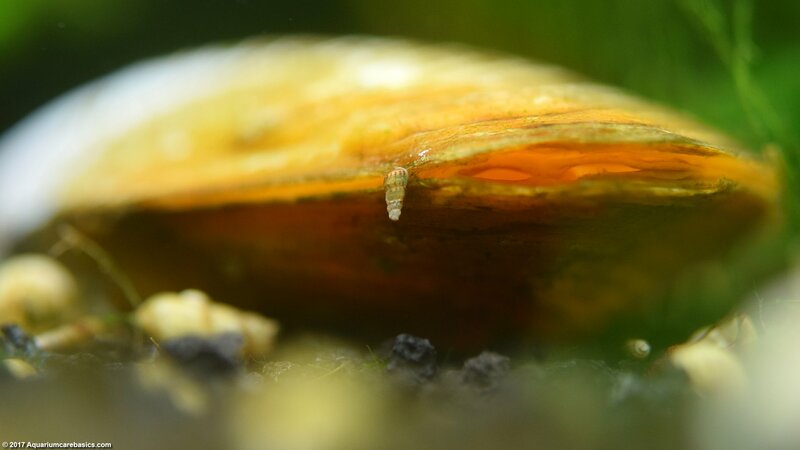 If the Freshwater Clam shell is open more than a bit, or the inner tissues cannot be seen, the Freshwater Clam may be unhealthy, dying or dead. A healthy Freshwater Clam will likely slam shut if touched with a net, so look for slight shell movements before selecting. 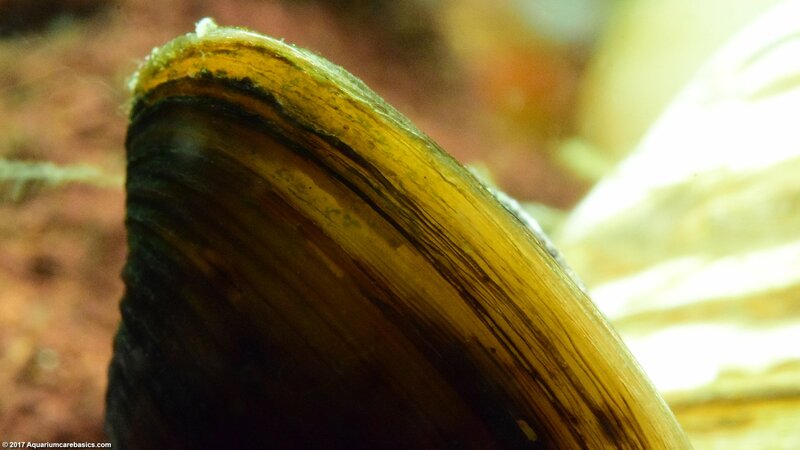 Shell Size, Texture & Color: Freshwater Clam shells can be between one and two inches in size. In some cases the clams may be a larger. 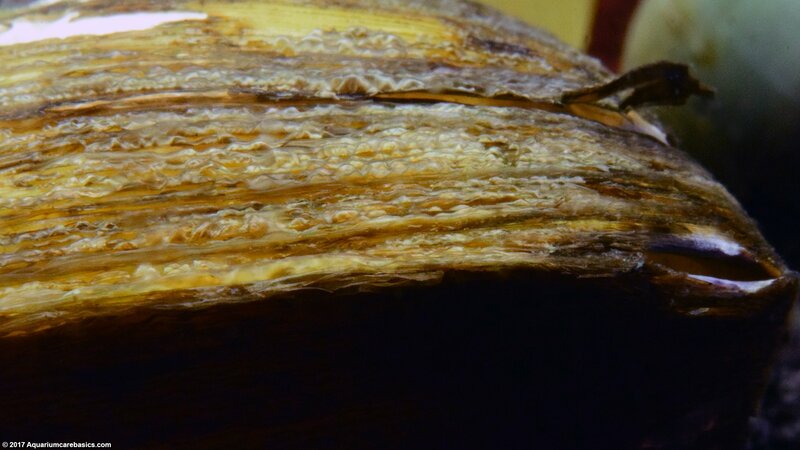 Look for Freshwater Clam shells that appear thick with a ridged texture on the exterior. 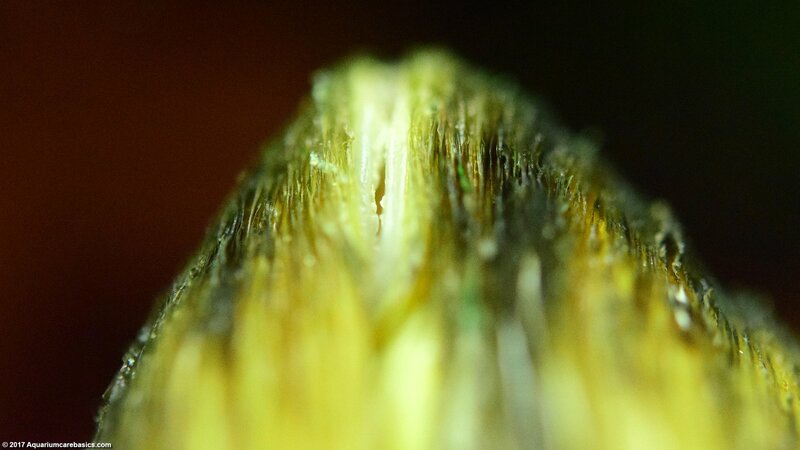 Also look for shells that are free from cracks, splits, pits and other deformities. 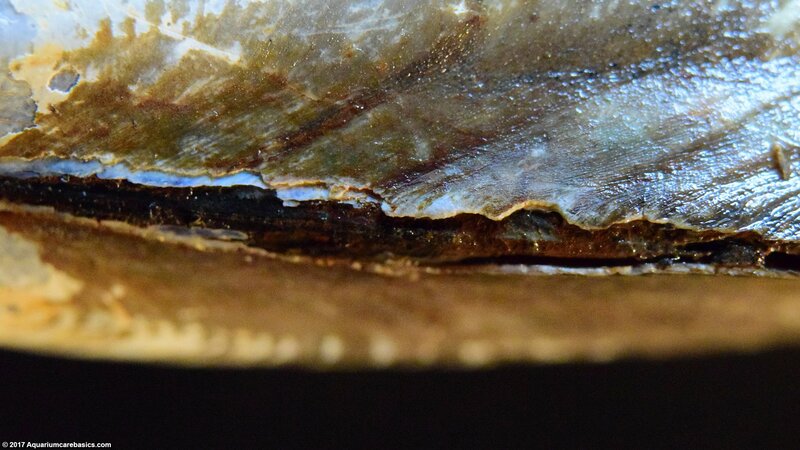 Freshwater Clam shell color can range from dark brown to light brown or tan. Clam shells often have black stripes or other subtle designs. Freshwater Clam shells may also have areas that appear to be chalky-white. 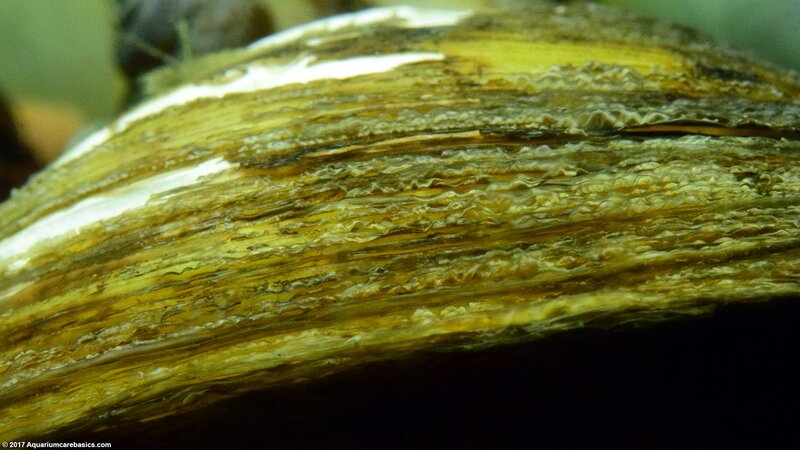 And it’s not uncommon for Freshwater Clam shells to be covered with small patches of green algae. A larger type of Freshwater Clam is the Asian Gold Clam. Keeping Freshwater Clams can be easy in many ways. 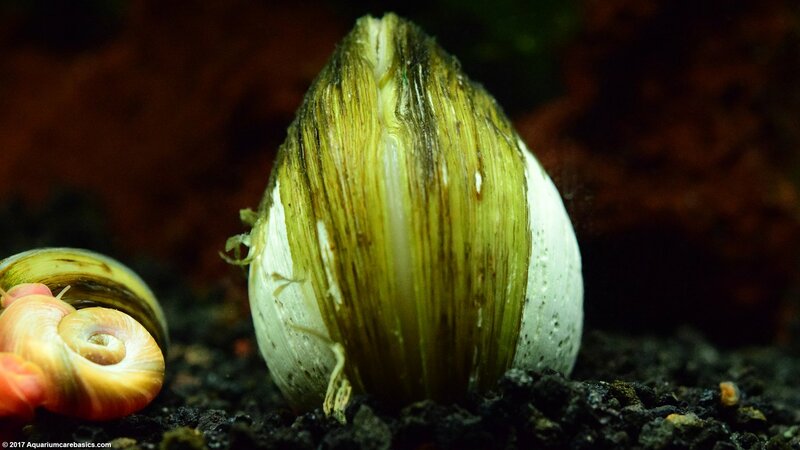 Under the right circumstances and in the best conditions, Freshwater Clam care can be as simple as placing the clam upright on the substrate. But if circumstances and conditions are not right, Freshwater Clam care can be difficult. Freshwater Clams do not live very long if the environment and habitat are not able to meeting their needs. 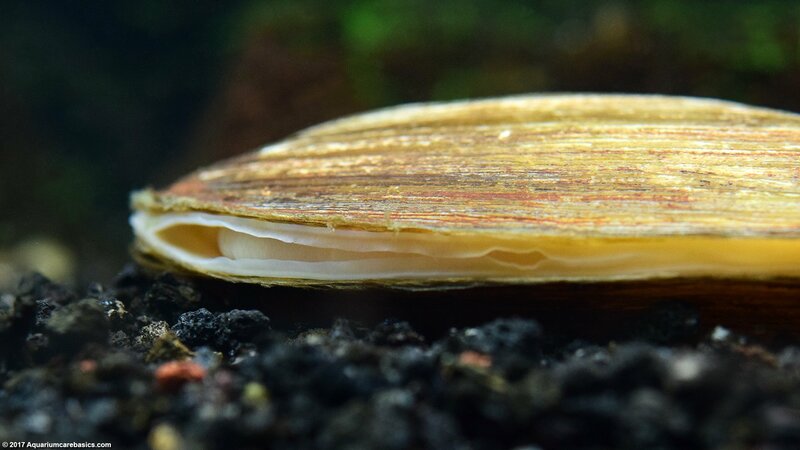 Freshwater Clams spend their time resting on the tank bottom. 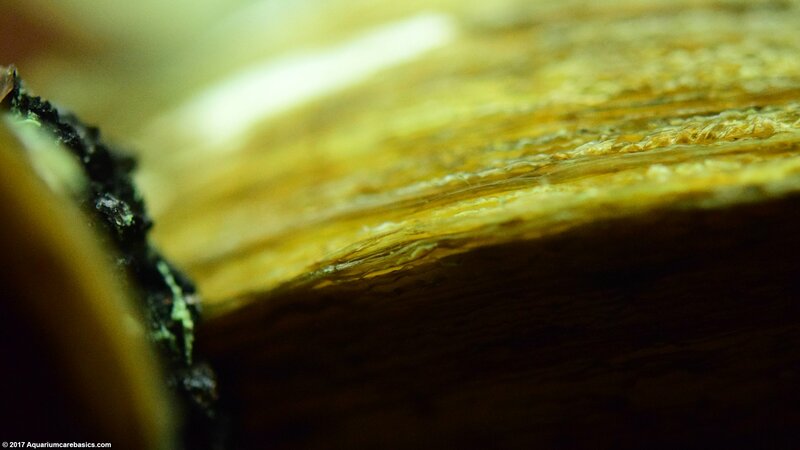 They may slowly burrow into the substrate until they are nearly covered, leaving only the slightest glimpse of their shell and siphon visible. So make sure the substrate is fine enough and deep enough to allow the clam to bury itself. With aquarium pH, some hobbyists suggest that lower aquarium pH in the upper 6’s may also be acceptable to Freshwater Clams. Others try to keep aquarium pH above 7. Water on the acidic side may not be best for the clam’s shell over the long term. Ammonia and Nitrites should be 0 ppm, and Nitrate levels should be kept in check with regular partial water changes. Calcium is important too. Freshwater Clams need calcium for healthy shell growth, so it may be worth testing water for Calcium and supplement as necessary. Take care to avoid medications with copper, as copper can be fatal to Freshwater Clams even in very small amounts. Also, be cautious with plant fertilizers. 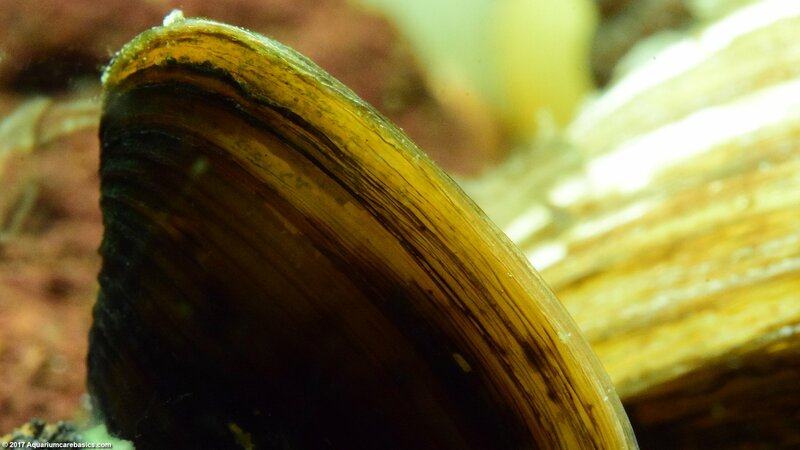 Freshwater Clams may be sensitive to some of their ingredients. 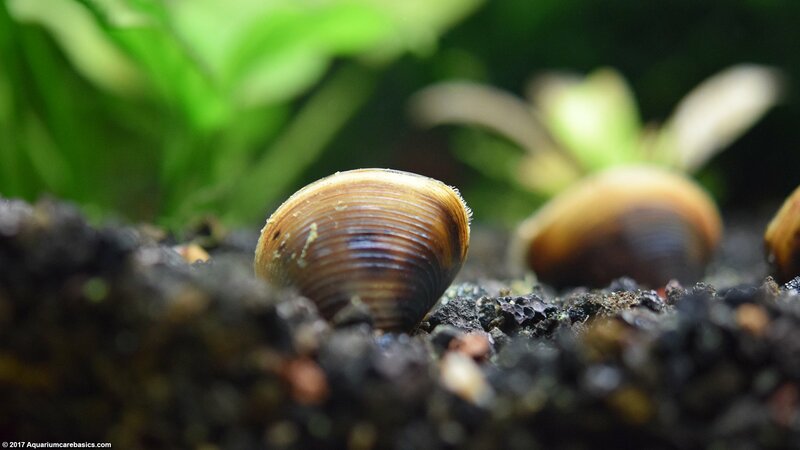 Be sure to check with the store clerk before adding any plant fertilizers and medications to a tank when keeping Freshwater Clams. Freshwater Clams are filter feeders subsisting on a diet of tiny bits of floating edible matter in the water column. The source of this “floating food” can be naturally occurring and from supplements. Freshwater Clams like tanks that are not “too clean”. Aquarium water needs to have plenty of very tiny debris, detritus and decaying matter floating in it. This does not mean that the tank cannot be “aesthetically clean”, it simply means that aquarium water needs to contain sufficient levels of edible matter for the clam to eat. To this end, keeping Freshwater Clams in moderately or heavily planted tanks is a good idea. Live aquarium plants continuously shed edible plant matter into the water column. In most cases, feeding a Freshwater Clam naturally occurring edible material is not enough. It may be necessary to supplement a clam’s diet with very finely ground Calcium enriched pellets or tablets, fish flakes or algae wafers. As these supplements dissolve, a Freshwater Clam will begin filter feeding them out. Keep in mind it’s important to avoid overfeeding as access organic matter in aquarium water will lead to water quality issues. Use common sense and test tank water for ammonia levels often. 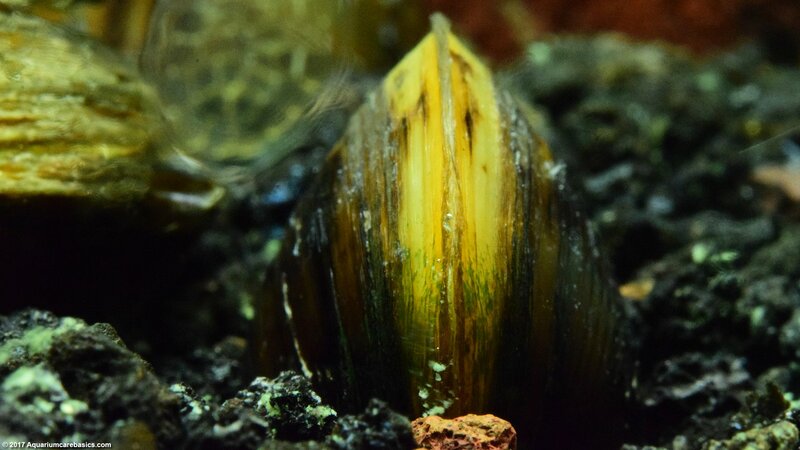 Another important Freshwater Clam care issue relates to aquarium size and the amount of water it holds. 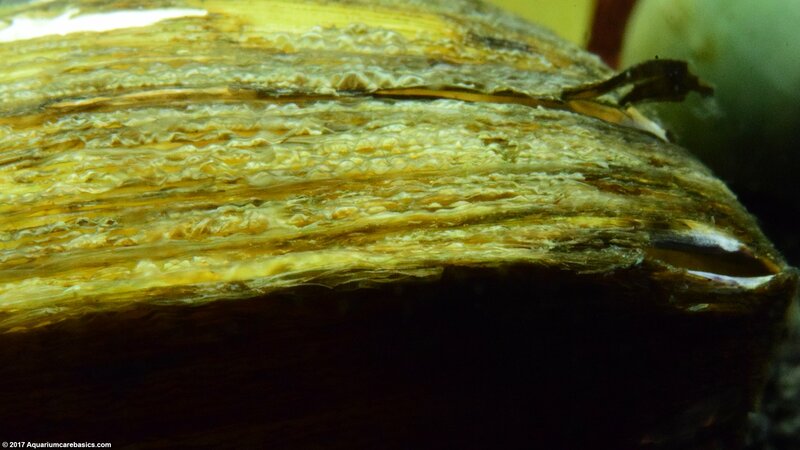 There needs to be enough water in the tank to hold sufficient edible matter to support the clam’s nutritional needs. 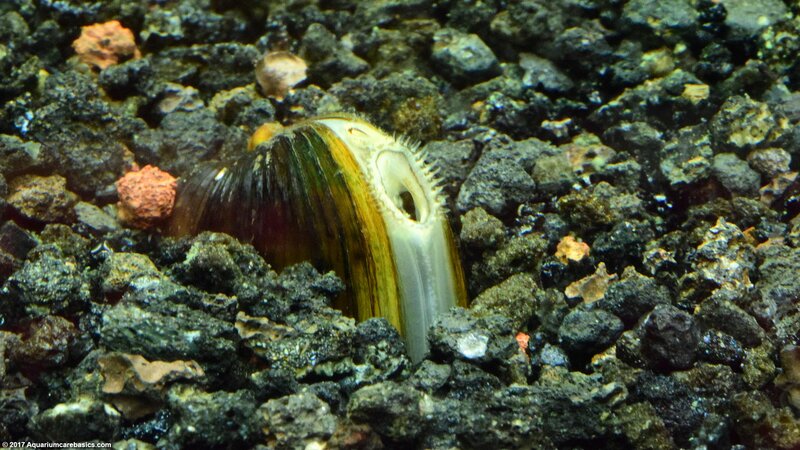 Some suggest one Freshwater Clam can be kept in small tanks like a 10 gallon aquarium. Small tanks may suffice, but in general, the bigger the tank the better. A 29 gallon aquarium may be a safer choice for one clam. Note regarding overstocking: Its important to be mindful that keeping Freshwater Clams is like keeping other inhabitants in a tank. 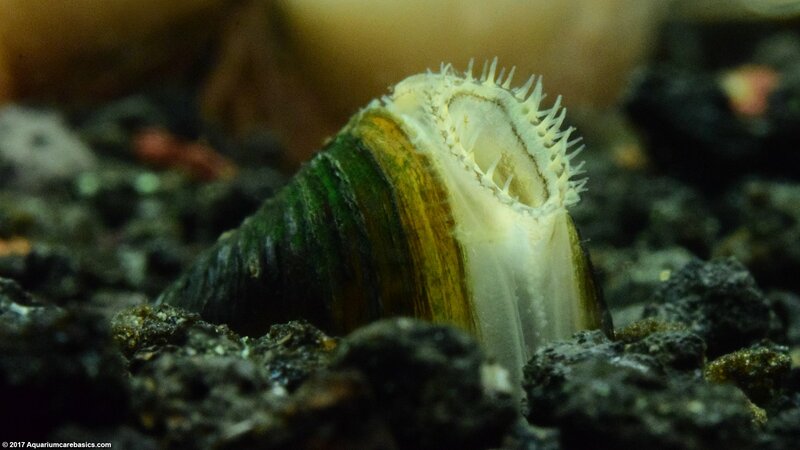 New hobbyists may think that because Freshwater Clams are “filter feeders” they will make water “cleaner” overall. 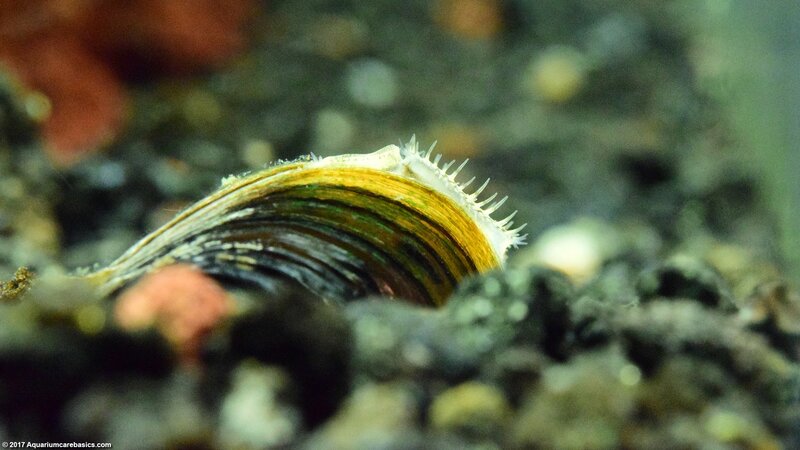 On one level this may be true, but Freshwater Clams also add to the bio-load of a tank like other living organisms. Therefore, its important to avoid overstocking. This is another reason why keeping Freshwater Clams in larger tanks may be a safer bet than small tanks. The bio-load processing capacity of small tanks are pretty limited and the margin for error is thin. Aquarium water also needs to be well oxygenated, and moving at a moderate and continuous pace. 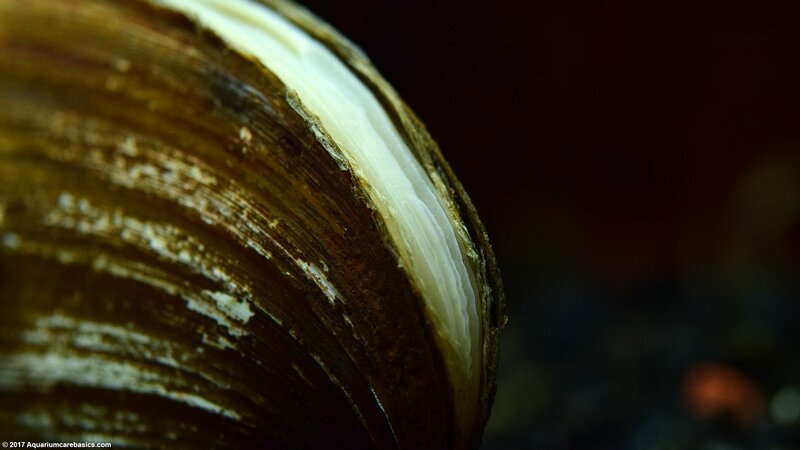 If the water current is adequate, Freshwater Clams will be better able to filter enough edible material to stay healthy. 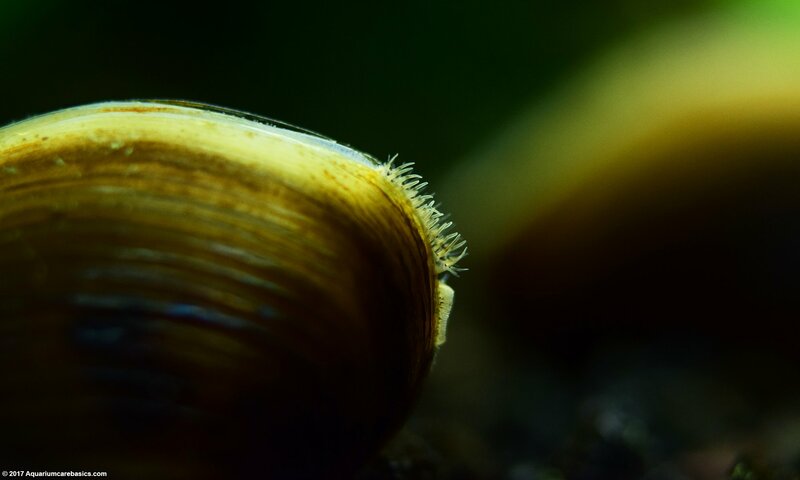 If the water current is inadequate, Freshwater Clams may be unable to filter enough edible matter to survive, even if the water holds a lot of food. It’s a good idea to keep Freshwater Clams in spots where tank water is really moving, like under a power filter return. With a little luck, a Freshwater Clam can live 6 months or more. That said, one of the issues with Freshwater Clams is that a quick death is possible. Maybe it’s due to the shift in water parameters between the display tank and the home tank, the stress of being transported, hunger or other factors. Either way, it’s something to be aware of. When keeping Freshwater Clams, it’s very important to be on the lookout for anything that suggests something is amiss. 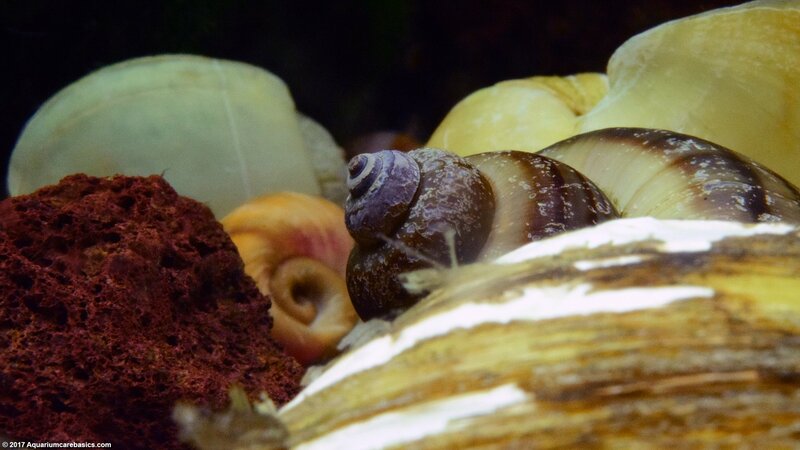 Telltale signs of trouble include: the clam shell opening wide, sudden ammonia spikes, deaths of tank mates, and tank water getting cloudy or developing a foul smell. 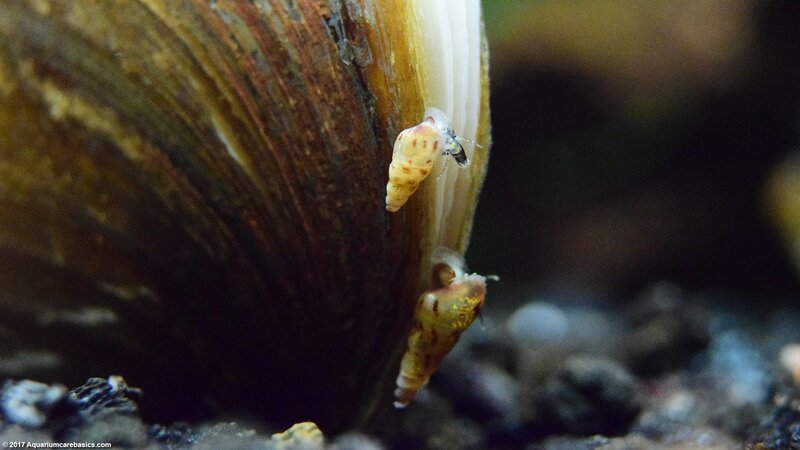 If there is a suspicion the Freshwater Clam is dead, it’s important to remove it from the tank right away. Gently lift the clam from the tank with a net for inspection. A dead clam will have an unmistakable repugnant odor.